You know we hads dem babies born before Christmas and da littlest one his name is Gatsby...but he was borned wiff a deformed back weg that has no muscle tone and da vet says he is prolly going to have to have it amputated...dats so sad...so if anybuddy wants to helps out and maybe win some beautiful Boxer artwork...I'v you man...just let me know and I'll hook ya up!! Hi, Joker! 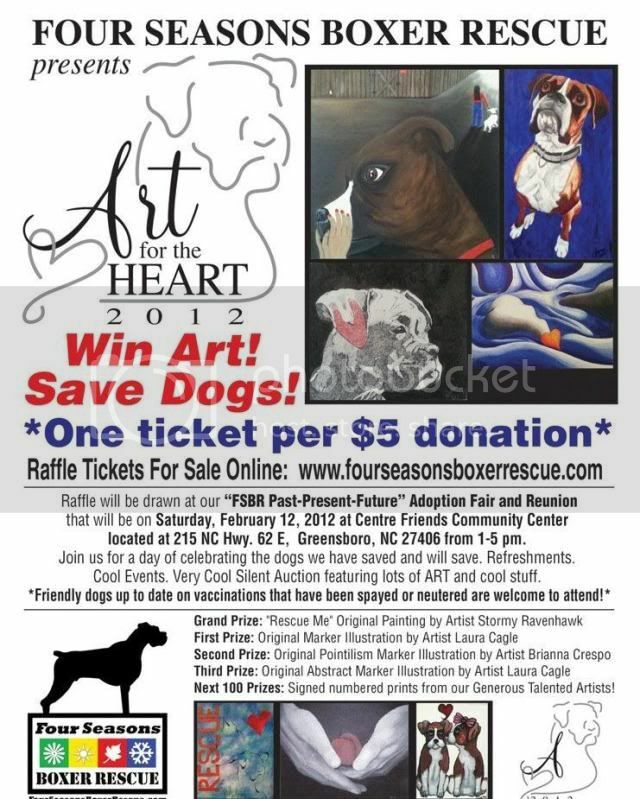 Good luck with your contest, hope you sell all your tickets and win lots of money to rescue more Boxers! I'm not really into art except for one thing, a Boxer tattoo. I have absolutely no artistic skills, can't even draw stick figures, but know exactly what I want and am picky, have asked a few people who are good at art and photography but haven't received any help yet. So I am wondering if maybe one of the artists who contributed to your contest might be willing to help me with my design? I would of course be willing to compensate them fairly for their work as well as make a generous donation to FSBR if you help me find someone to draw the picture I need for my tattoo. It would have to be someone not only good at art but familiar with European style Boxers and correct Boxer conformation, and hopefully someone who has drawn a picture for a tattoo before. Oh how cool Lisa!! I do not know who all the artist are but one of them is Stormy Ravenhawk....an extremely talented woman but there are several others as well...Briana and Charme have been in charge of getting the artwork together and I am sure that they would be more than glad to talk with you about the artists and your request. Send them a message on FB and see what they can do to help you out...that is so cool and I would love to see the finished product for sure!! How do we get our tickets again? Was there a paypal account last time? I think I sent you the check, if I recall? We're kinda tight right now, but would still like to purchase 6 tickets for the cause. Gotta help those boxers in need, whether we win something or not. Thanks Dawn....that is so sweet...I know you have a lot happening right now so this really touches my heart You can send me a check if you like (made out to FSBR) and we will send you your tickets or if you would rather pay by paypal you can go to the FSBR website and order them there if that is easier...just be sure you tell them that Joker sent ya!! 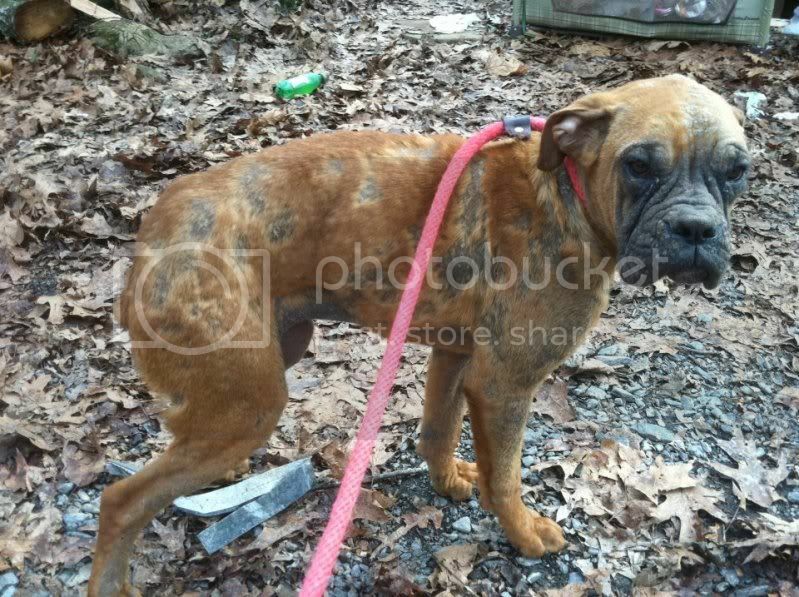 LOL Thanks so much...did you see our latest new girl that is covered with mange...she is breaking my heart just 9 months old and has mange as bad as Bentley did... Thanks so much!!! Awesome! I did Paypal this time. I've been so bad with getting checks out lately, figured this way I'd be sure to get er dun! We put in the instructions - "Joker sent me!" I did see lil Roxy. OMG! How sad! These cases just about kill ya. Who can do this kinda stuff? Seriously?! They can't be human! No matter what we're going thru, there are still other boxers out there that need help and do not have anyone else advocating for them other than rescue resources. Those are the ones that truly need our help. So, I'm happy to do it. Thanks so much Dawn!! You're the bestest...as Joker would say! Poor little Roxy's former owners said they WERE treating her mange but just couldn't seem to turn it around so they surrendered her to us...not sure what they were doing but we have her now and we WILL turn it around for her...I see pictures of Bentley now and I just cannot believe he is the same dog...and he is just as happy as a little ol pig in slop and we can do that for Roxy as well!! BUT we can't do it without folks like you who are willing to help out!!! Thanks from the bottoms of our hearts!!! Hi Joker! Count me in! And, "THANK YOU" for helping those dogs in need! Yippppeeeeee....how many do you want? Do want to send a check to our address or use PayPal on the website? Either way is fine...which ever you prefer...but remember if you use the website be sure to tell them that Joker sent you!! I tolds dem giwls dat I could sell 100 tickets and I am gonna do it!!! Thanks sooo much and remember all da tickets dat I sells gets fwee Joker kisses for Good Luck!!! Joker, you are one lucky pup with all those kisses coming your way! I used PayPal on the website to order my tickets, and I told them, "Joker sent me!". Keep up the good work! Briana just forwarded us your ticket order and we'll get them to you in tomorrows mail!! Thank you so much and they will be covered with Joker kisses for Good Luck!! Duh! I get it now! Joker is giving away the free kisses! I thought he was getting the kisses for selling tickets! Which he should, by the way! LOL...Joker is the FSBR Fundraising Cheerleader and that is his big claim to fame...giving "fwee Joker kisses" (as he calls them) with every donation!!! Thanks again and we hope you win!! Poor sweet Roxy....just 9 months old...but we have her now and are gonna fix her up good as new....you can help by buying a raffle ticket for our Art For the Heart Fundraiser from Joker!! !